Choose a storytelling format that attracts and engages the ideal prospects for your innovation. It will shorten your sales cycle, increase your conversion rate, and produce more of the customer successes that drive widespread adoption. 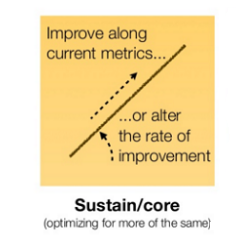 Sustaining innovations are used by incumbents to compete with current competition. The adoption strategy for a higher performance innovation should be to target profitable users of existing solutions who are willing to pay for improvements. Stories should describe the impact of sustaining innovations that improve performance to engage users of existing solutions who need them. Low end innovations deliver lower performance solutions at a lower price than available existing solutions. The adoption strategy should be to target customers who are happy with a good enough product, and not willing to pay premiums for performance or functional enhancements. Stories should demonstrate vendor commitment to low end customers by retaining the brand qualities associated with existing solutions. New market innovations make product or service solutions available to new or emerging market segments not being served by incumbent solution providers in the industry. Stories should educate these markets about the benefits the innovation provides, who it serves, and encourage trial or demonstration to early adopters.